In recent times we’ve seen an increase in technology that focuses on quicker and easier payment transactions. Most people now use contactless credit cards in order to pay for something, whereas some smart cards will consolidate all your flexible friends in to one, like Coin. Yet a machine named PulseWallet wants to eradicate the card altogether. All it does is scan the veins in your hand and then charge your credit card. 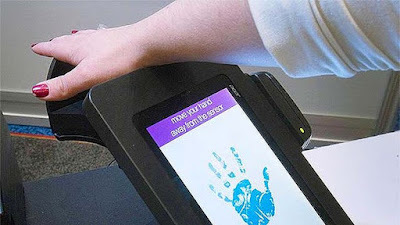 Effectively PulseWallet is a palm scanner; a credit card terminal and register, with a built-in biometric palm reader. Inside it contains a Fujitsu camera. Along with PalmSecure technology it scans your palm. It creates an infrared image and then converts it into a biometric template, which is then stored in the cloud. Once the photograph has been paired with your credit card, you can hold your hand over any PulseWallet station and pay with your chosen credit card. The device looks for a perfect match in its database and once it locates the data, your identity is verified. CTO for PulseWallet, Matt Saricicek, says that most people’s veins stay pretty much the same once they pass the age of eight, so it is unlikely that you will need to keep re-scanning your hand to update the database. The technology is said to be accurate about 99.9% of the time and to try and make it 100%, PulseWallet requires that you also enter your telephone number as a secondary check. If you own a business, it is possible to connect the terminal to a point of sale cash register or to the PulseWallet’s bundled register. Apparently transactions take seconds, which is always a postive thing in our busy daily lives. Whether PulseWallet will take off and become popular with businesses, will depend a lot on its register software and the cloud infrastructure to store users information. “Biometric is the future,” Saricicek insists. “Now we can unlock our phone with our fingerprint. We’re becoming lazier, and we demand convenience.” Once PulseWallet has been set-up there is no denying that it is super quick but that is not the only hurdle to mobile payments. In order for it to succeed, the PulseWallet technology will have to build a reputation as a very secure authentication platform before any retailers will even consider using it, and that is easier said than done. So is the time right for biometrics? What do you think?